13-Jul-2018: Technology created by researchers at the Okinawa Institute of Science and Technology Graduate University (OIST) is literally shedding light on some of the smallest particles to detect their presence - and it's made from tiny glass bubbles. When light is shined into the sphere, it bounces around and around the inner surface, creating an optical carousel. Photons bouncing along the interior of the tiny sphere can end up travelling for long distances, sometimes as far as 100 meters. But each time a photon bounces off the sphere's surface, a small amount of light escapes. This leaking light creates a sort of aura around the sphere, known as an evanescent light field. When nanoparticles come within range of this field, they distort its wavelength, effectively changing its color. Monitoring these color changes allows scientists to use the WGRs as a sensor; previous research groups have used them to detect individual virus particles in solution, for example. But at OIST's Light-Matter Interactions Unit, scientists saw they could improve on previous work and create even more sensitive designs. Today, Dr. Jonathan Ward is using WGRs to detect minute particles more efficiently than ever before. The WGRs they have made are hollow glass bubbles rather than balls, explains Dr. Ward. "We heated a small glass tube with a laser and had air blown down it - it's a lot like traditional glass blowing". 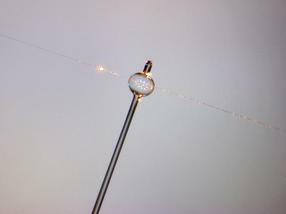 Blowing the air down the heated glass tube creates a spherical chamber that can support the sensitive light field. 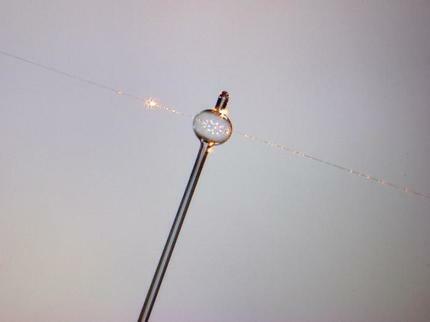 The most noticeable difference between a blown glass ornament and these precision instruments is the scale: the glass bubbles can be as small as 100 microns- a fraction of a millimeter in width. Their size makes them fragile to handle, but also malleable.